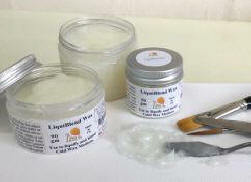 The LiquiBlend Wax was developed as a diluent (dilutant) for Cold Wax Painting Medium. Cold Wax Painting Medium can be diluted with the Wax Solvent to alter its working properties, this affects its viscosity and the surface finish. The LiquiBlend Wax keeps the wax properties much truer to the original Cold Wax Painting Medium when the product is diluted. 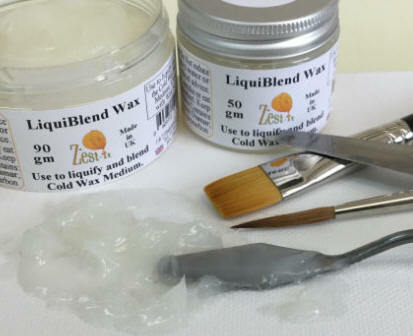 The LiquiBlend can be used to 'liquify' the Cold Wax, making it more movable and blending much easier. The brushes or painting knives are best cleaned with Wax Solvent, it's best practice to keep brushes and knives used for Wax painting away from water. Have 'safety sense' when using any solvent. Use in a ventilated area, away from sparks and flames, do not heat the product. Keep away from children, do not eat, drink or smoke when using the product (no water bottles in the same area!). It can travel by road, sea and air, which makes it an excellent accompaniment if you are going on a painting holiday (depending on the airline). Dispose of the any 'wax/paint sludge' by putting onto damp sand or soil in a container. Do not throw the liquid or brush washings down the sink. Available sizes: 50 gm; 90 gm; 140 gm.